University Housekeeping zone managers and leaders celebrate their recognition at the university’s annual Green Brick Awards for sustainability. All 25 areas of the department achieved Wolfpack Certified Sustainable status. The days of cleaning campus with a broom and paper towels are long gone. Instead NC State’s nearly 300 housekeepers clean campus more effectively and sustainably than ever, and University Housekeeping is looking to raise the bar even more. Recently, University Housekeeping customized NC State’s sustainable workplace certification as a way to benchmark the department’s sustainability progress and guide future initiatives. The Wolfpack Certified Sustainable program, which is offered by the University Sustainability Office, recognizes campus workplaces and events for implementing sustainable best practices. Instead of using the certification as-is, Housekeeping’s sustainability committee worked with the Sustainability Office to customize a survey that would best assess the department’s unique opportunities to advance sustainability. 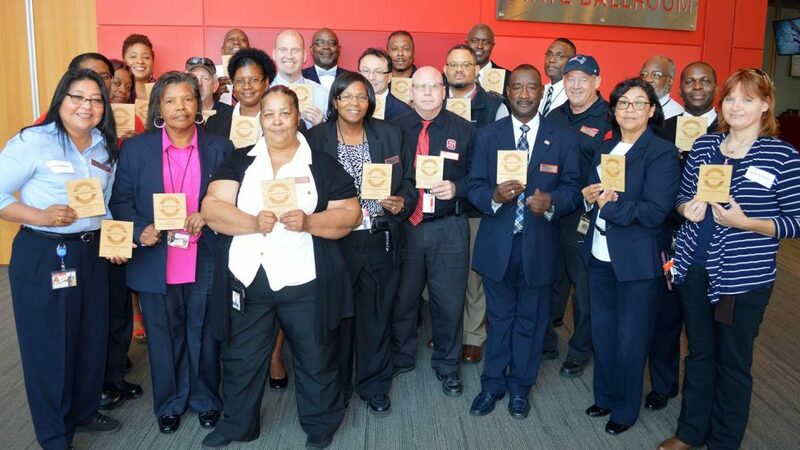 All 24 of Housekeeping’s zones, plus its administrative office, earned Wolfpack Certified Sustainable status, including 10 zones at the highest Champion level. With a baseline established, Housekeeping intends to tweak the survey annually so that the certification helps drive additional sustainability efforts. Already, the department’s work is award-winning. Recognized last year as a Silver winner in the annual Green Cleaning Award for Schools and Universities competition, the department has been integrating sustainability since 2008 when it began a green cleaning program to reduce chemical use. A water-based cleaning system allows housekeepers to clean most campus surfaces with technology that converts water, electricity and a small amount of salt into an effective cleaning solution. This reduces the amount of packaged chemicals shipped to, stored and used on campus. “These chemicals don’t go down the drain, there aren’t any fumes and we don’t have to keep backup chemicals for housekeepers who might be allergic to a product,” said Christian Davis, one of Housekeeping’s deputy assistant directors. While some speciality chemicals will always be needed for unique applications, Housekeeping now uses more Green Seal-certified cleaning products than ever. Dispensing stations pre-measure chemicals in order to reduce water usage and ensure accurate, safe dilution. Most of these products are applied not with disposable wipes and mops but with microfiber clothes that reduce waste and water use while also cleaning more effectively. Housekeeping even added a small laundry facility in Polk Hall so that microfiber clothes could be cleaned cost-effectively and with sustainable soaps. When microfiber clothes are picked up from housekeepers for cleaning, floor cleaning pads are collected as well for shipment to a nearby refurbishing facility. There, pads can be regenerated for reuse up to 8 times, saving money and reducing waste. In addition to cost savings and waste reduction, housekeeping employees also benefit from sustainability efforts. Ergonomic advances have made equipment more user-friendly, and better indoor air quality comes from using vacuums with HEPA filtration and chemical-free floor refinishing that uses just water and friction. “Those small differences that might not be noticed are everything with respect to the wellness of our employees, safety and saving university money. It’s not just about being green. This initiative is about being good stewards,” Davis said. In addition to sustainable products and supplies, employees receive regular training on green cleaning, including the latest techniques, products and supplies. The department is also converting more and more processes to paperless. With electronic tablets, zone managers can order products and submit work orders electronically. What used to require a trip in a vehicle across campus to the department’s headquarters in Administrative Services III is now more efficiently accomplished through a scanner and email. Published in Materials and Purchasing, News, Newswire, Staff, Wellness.